Some people never meet their HERO I raised mine. 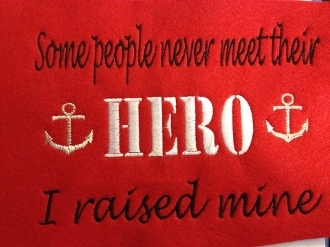 This design is embroidered and approximately 5" x 7". You choose the shirt color and two colors for the embroidery. The Anchors are done in silver metalic. There are lots of choices for the thread color so the posibilities are endless. You could also get the whole design in one color by choosing the same color for both options. The shirts are co-ed sized and made to fit men or women so choose your sizes accordingly. Please contact us if you have any questions at all.